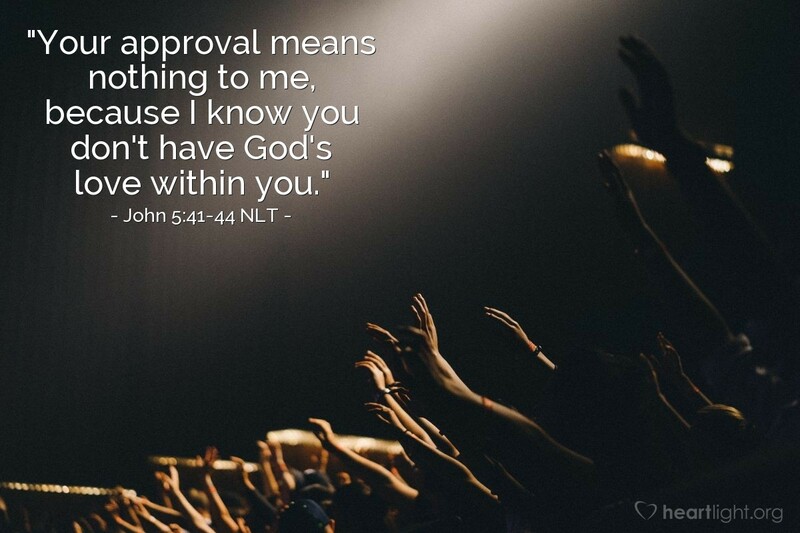 [Talking to Jewish leaders who opposed him, Jesus said,] "Your approval means nothing to me, because I know you don't have God's love within you. For I have come to you in my Father's name, and you have rejected me. Yet if others come in their own name, you gladly welcome them. No wonder you can't believe! For you gladly honor each other, but you don't care about the honor that comes from the one who alone is God." Whose approval are you trying to receive? Peer pressure is powerful in the lives of teens, but if we are really honest, adults are just as susceptible to peer pressure. Look at designer fashions, hot cars, house styles, popular movies, top ten books, and a host of other areas. Can we stand with Jesus and stand up to the ridicule of others, or do we cave in, hide out, or give up our faith when it's unpopular? Sometimes our churches are stained glass museums filled with spiritually impoverished people afraid to speak up for Jesus because they're too concerned about what others think and say. Let's pray that we may be both bold and respectful in sharing our faith in Jesus (Acts 4:31, 1 Peter 3:15-16). Glorious Father, please give me the courage to stand up for Jesus as much in the marketplace as I do when I am around other believers. Help my witness to be genuinely consistent as well as sensitive to those around me. Forgive me when I have been more concerned about what others think about me than I have about honoring Jesus as my Lord. In the name of your Son and my Savior, I pray. Amen.